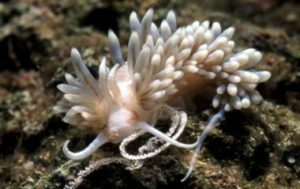 A sea slug that preys exclusively on pest Glassrose anemones (Aiptasia spp.). A white-colored sea slug (family Aeolidiidae) with beige color at the base of its gill filaments. In well-fed individuals, the gill filaments may contain more brown color from ingested zooxanthellae. The zooxanthellae ingested with Aiptasia tissues reside within Berghia briefly before it is expelled, giving its gills a brown color. It is not known whether Berghia utilizes photosynthates from the zooxanthellae, or that the algal endosymbionts are simply passing through. The tendency for Berghia to hide in dark recesses and their survival in dimly lit tanks suggests that they are not dependent on the zooxanthellae. A sea slug that preys exclusively on pest Glassrose anemones (Aiptasia spp.). Berghia will hide in crevices away from light, only coming out to feed on Aiptasia in the dark. When the Berghia population is substantial and Aiptasia are becoming scarce, Berghia may be forced to forage even during lit hours. Berghia will ignore other reef invertebrates and corals and is ideal for coral reef aquaria. Proaquatix specimens have been raised on a strict diet of Aiptasia tissue and will continue to prey exclusively on Aiptasia anemones.